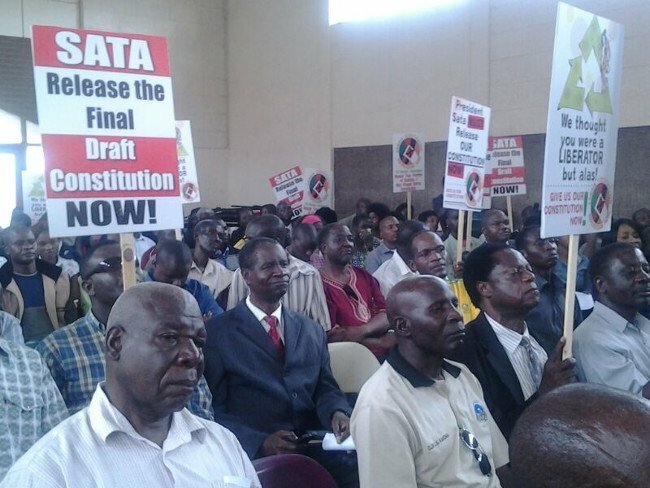 The opposition FDD- leadership on the Copperbelt has condemned the reported plan in which the Grand Coalition on the People Driven Constitution and the Law Association of ZAMBIA-LAZ- allegedly intend to go to court this week to block the Constitution Amendment Bill. FDD Copperbelt Provincial Chairman Yotam Mtayachalo says the plan is premature and may just deny Zambians a new constitution before the 2016 general elections. Mr Mtayachalo says all stakeholders should give dialogue a chance and explore other avenues such as seeking an audience with President Edgar Lungu on the way forward on the constitution. He says this will afford parties a chance to iron out areas of misunderstandings before taking the legal route. Mr Mtachalo says the court action will delay the whole process resulting in the 2016 general elections being held under the old constitution. He said all parties can still strike a compromise for the country to achieve a people driven constitution. The Patriotic-PF on Sunday announced that it had unearthed a scheme in which the Grand Coalition on the People Driven Constitution and Law Association of ZAMBIA-LAZ allegedly intend to go to court this week to block the Constitution Amendment Bill. PF Media and Publicity Vice Chairperson Sunday Chanda charged at a media briefing in Lusaka, that such schemes by the Grand Coalition and LAZ will only frustrate efforts to give Zambians a new constitution.